And I procrastinated to work on this? And I’ve finished the anagrammed MARTA map. Enjoy… I think some of these anagrams are really funny. Click on the thumbnail below to view full-size. In the interest of accessibility, a full list of anagrammed station names follows, each listed with its real-world equivalent. OK, that’s it. Now that there are anagrammed versions of the London Tube and Toronto Transit maps out there, I’ve decided that I’m going to work on an anagrammed MARTA map for all the wordplay-loving Georgians. And for “Brookhaven/Oglethorpe University” I came up (with the help of the venerable Wordplay program) with the wonderful “Pothole Saviour/Everything Broken.” Hee. This is way too fun. Hey, kids! It’s mistaken identity time again! Time to shame (but not name, because I’m too nice of a person) those people who are firmly convinced that I’m not who I really am! This isn’t, for the record, the first time this has happened; back in 2002, I posted a transcript of a similar incident to my site. Subject: Medicines before Valentine Day !!! Heh, this is amusing. The New York Times , in a little opinion feature on Dance Dance Revolution in schools, quoted my blog post from a couple weeks ago in which I mused that it was far more fun than being hit by volleyballs. 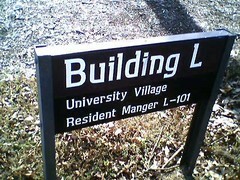 Interestingly, ‘manager’ was spelled correctly on the other side of the sign. Go figure, eh? And oh, yes, this also serves as an example of the sign typography I had mentioned back in December.